The New Thracian Gold is a project of the Dutch nature preservation organizations ARK and Avalon. By 2014 they will work on supporting economic growth and welfare in the Eastern Rhodopes Mountains by developing activities which combine organic farming, nature preservation and tourism. The project is financially supported by the Dutch Postcode Lottery in the period of 2009 - 2014. A few dozen couples of griffon vultures in several colonies are still incubating and expect to hatch their young soon. Meanwhile, the first couples of Egyptian Vulture (Neophron percnopterus) are back in the Eastern Rhodopes and began to set up their nests. The New Thracian Gold project administrators remind that in the past thousands of griffon vultures lived in Bulgaria. In the 20th century they became victim of the massive anti-wolve campaigns with poisenous bait. The toxic carrion appeared to be lethal for the vultures and the birds got extinct. Egyptian vulture is a globally threatened species. A few centuries ago it was a numerous bird and even nested on the hills in Plovdiv (Southern Bulgaria), the second biggest city in this country. Twenty years ago in Bulgaria there were about 100 couples of Egyptian vultures and in 2010 - only 33. If the Egyptian Vulture population decrease continues at the same speed, the species will disappear from Bulgaria in the next decades. In 2010 twenty five couples of Egyptian vultures -75% of their population in Bulgaria - nested in the Eastern Rhodopes according to the Bulgarian Society for the Protection of Birds. 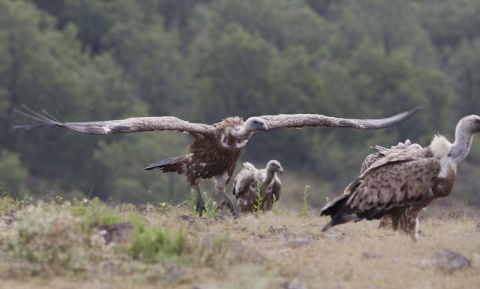 Thanks to the special vulture feeding sites with good supply of "clean" carcasses ( not contaminated) the number of Egyptian vultures in the Eastern Rhodopes has not decreased over the past five years. Every year, many tourists and photographers visit this the Eastern Rhodopes to observe vultures and take pictures.